The Paulick Report once again offers a special print publication for the Keeneland November Breeding Stock Sale, which begins Tuesday in Lexington, Ky. In this edition of the PR Special, we re-enter our Kentucky Farm Time Capsule, focusing this time on Hamburg Place. 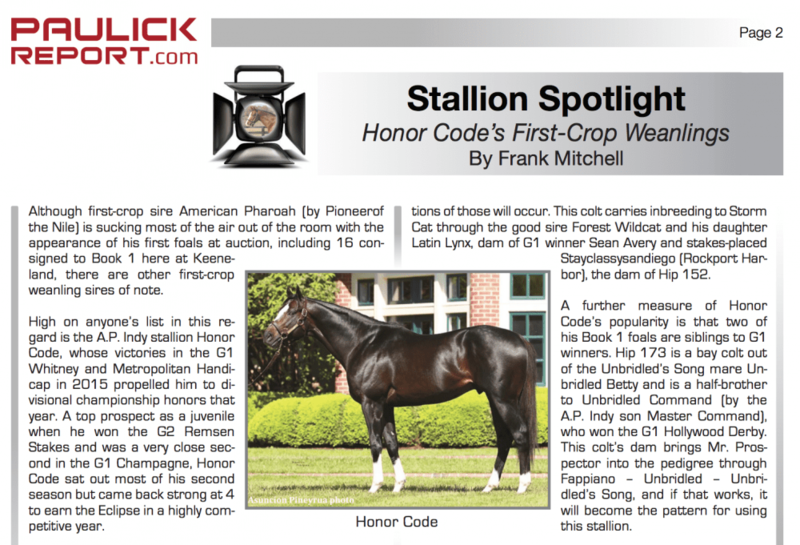 Frank Mitchell turns his Stallion Spotlight on Honor Code's first crop weanlings while looking at other hip numbers garnering attention in Five To Watch. Our Honor Roll focuses on Diversify, Jockey Club Gold Cup winner and Keeneland November graduate. Plus, more information available on pregnant mares in Ask Your Veterinarian. Click here to read this edition of PR Special Keeneland November. This entry was posted in PR Special, Ray's Paddock and tagged diversify, hamburg place, keeneland november, keeneland november sale, PR special, Thoroughbred Auctions, thoroughbred sales by Paulick Report Staff. Bookmark the permalink.